OGDENSBURG, N.Y. – It was a surprise victory. Most Republicans in the small town of Canton, N.Y. did not expect Donald Trump to become the president-elect of the United States. In fact, Republican Tim Knapp, 21 and President of the Potsdam College Republicans, didn’t become optimistic until Trump won Ohio. He wanted to, and expected to, retain Congress, but to win the presidency came as a surprise. 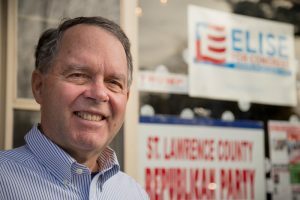 Earlier in the day, the chairperson of the Republican Party in St. Lawrence County, Thomas Jenison, was looking to the future of his political movement. And unless he wins, that future is not Donald Trump, said Jenison. That future now seems very different than it did 24 hours ago. Donald Trump has beaten Hillary Clinton in the 2016 Presidential Election and in doing so squashed any ideas of party fragmentation or disunity. “Trump will have lasting influence whether or not he is elected president,” Jenison said in an interview earlier in the day. In Jenison’s view, Trump had struck a chord, especially among many who haven’t voted before or in recent years. Jenison made it clear that he was only supporting Trump out of party loyalty. “Do I support Trump? I support the Republican Party candidate, and that happens to be Trump,” Jenison said. He used to be a supporter of John Kasich, but since Trump won 55 per cent of the New York vote Jenison had to sign a paper saying that he would support Trump. Jenison was so loyal that he seemed able to shake off many of the controversies facing Trump. On the sexual harassment allegations against Trump, Jenison quickly points to Bill Clinton, saying that the former president is not “squeaky clean” either, that neither candidate has a perfect past. Trump, then, was the best of a bad lot for Jenison. But as for the future of the Republican Party, Jenison foresaw someone other than Trump in the leadership role: the current Republican House leader, Paul Ryan. As for what Trump means for the Republican Party, Vice-Chairmen of the St. Lawrence County Republican Party Fred Bean said he believes that Trump is going to change the party “back to where it should be,” back to the values that he believes it originally embodied, without the liberalism. And he sees Trump’s being a political outsider as a benefit. “We needed a businessman to run the country because, quite frankly, the country is a big business,” he said. It is this drastic change that the Republican Party will now have to rally around. Gone are the discussions of Republican Speaker of the House Paul Ryan as a potential leader for the future GOP. Now it is Trump, president-elect.